Walking: So many lovely walks! gentle strolls exploring the winding streets of this this classic wool town with its history, quirky shops and Rococo Gardens. Long and short rambles up over the Painswick Common Land with glorious views to west over the River Severn to Wales, through ancient Beech Forest, carpeted with bluebells in April and May, back through field and hidden valleys along the Painswick stream. Painswick is a walkers paradise of footpaths and country pubs, varied landscape and unspoiled scenery. 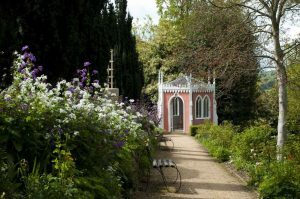 Rococo Garden and short walk: Taking in fine views down the Painswick Valley, along a delightful path through fields of wild flowers grazed by sheep, and passing ancient Cotswold stone farmsteads along the way. You can stop for lunch or tea at the Rococo Gardens and then spend an hour or two exploring the garden, full of secret hideaways, enchantment and abundant wild life. From January to April there are spectacular carpets of snowdrops. Stroud Farmer's Market: 3.5 miles. Saturday 9am - 2pm. We love the market. Farmers, locals, foodies, artists, musicians, hippies and friends, all gather on Saturday morning to drink coffee and buy delicious treats for lunch. Stroud is 3.5 miles south of Painswick. There are lovely walks into town along the ancient mill paths or catch the hourly bus.